Let It Ride poker is a lot like Caribbean Stud Poker. It’s a new casino game inspired by traditional poker, but you don’t play against the other players. Let It Ride poker was invented by ShuffleMaster, a company that manufactures automatic shuffling machines for casinos. Like blackjack or Caribbean Stud, Let It Ride is played at a semi-circular table with a dealer on one side and up to seven players on the other side. Unlike Caribbean Stud Poker, Let It Ride doesn’t require you to beat the dealer, either. It’s similar to video poker in that respect. Let It Ride poker players are just hoping to create a winning combination of cards which then pays out based on the strength of the hand. The player places a bet in each of the three circles, and this bet must be the same for each of the three circles. Most casinos have a minimum of $5 or $10. If you bet $10 in the $ circle, you also must bet $10 in the 2 circle and in the 3 circle. After the bets are posted, the dealer gives each player three face down cards. The dealer also deals two cards face down in the center of the table–these are the community card which will be shared by all the players at the table. To pull back the bet, you scrape your cards lightly on the table, and the dealer returns that bet to you. 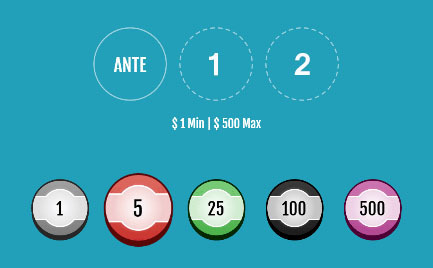 If you want to “let it ride”, you place your three cards underneath the bet in circle “1”. Then the dealer exposes one of the two community cards. Now the players get to make the same decision they made with the bet in circle “1”. They can pull back the bet, or let the bet ride. One point of confusion for some players new to the game is whether or not they can pull back the bet in spot #2 if they let their bet in spot #1 ride. The two decisions are completely independent of each other. If you pulled back your bet on #1, you can still pull back your bet on #2. If you “let it ride” on bet #1, you can also still pull your bet back on #2. And of course, whether you let it ride on bet #1, you can always choose to let your bet ride on #2. After this decision has been made by each of the players, the final community card is revealed, and winners are paid off. You do NOT get to decide whether or not to pull back the bet on the $ (Ante) spot. You’re always stuck with that one. Different Let It Ride hands trigger different payouts, due to the rarity of the hand. The best hand to get in Let It Ride is the royal flush, because it has the lowest odds of hitting and the highest payout. Most Let It Ride strategy deals with when to seek straights and flushes, and when to go for hands with better odds. The tables below show the Let It Ride odds for the main bet and the most common side bet. For reference, the odds of hitting a royal flush with a 5-card hand are 1-in-649,739. The odds for a straight flush are 1-in-72,192, while the odds for a four of a kind are 1-in-4,164. The player receives this payout for EACH of the bets she still has on the table. So if you’re dealt a royal flush, and you have $10 on each of the three betting spots, you’d receive $30,000 in winnings. If you removed either or both of the bets from betting spot 1 or 2, you receive NO payout for the removed bet. Let It Ride Poker has a house edge of 3.51%, placing the game in the middle of the pack of casino card games when it comes to house edge. The Let It Ride edge is comparable to Three-Card Poker, though much better than the 3-Card Poker’s Pair Plus side bet. Let It Ride odds are better than Caribbean Stud Poker, though not as player-friendly as famous games like blackjack, baccarat, and craps. Let It Ride’s house edge is better than American Roulette, while worse than European Roulette. The strategy for Let It Ride poker is very simple to use. Follow the strategies below to increase your odds of winning. If you have a winning hand in your three cards, you should let it ride. If you have three cards to a straight flush that are higher than 2-3-4, you should let it ride. If you have three cards to a straight flush with a gap, and one of the cards is 10 or higher, you should let it ride. If you have three cards to a straight flush with two gaps, and two of the cards are 10 or higher, you should let it ride. Otherwise, pull back your bet. One point of clarification is that a gap means that a card is missing from a sequence. For example, a 6-8-10 has two gaps–the 7 and the 9. On the other hand, a 6-7-8 has no gaps. This strategy probably seems conservative. That’s because the correct strategy for Let It Ride poker IS conservative. Most of the time, you’ll be pulling that first bet back. If you have any kind of winning hand, let it ride. If you have four cards to a straight flush, let it ride. If you have four cards to a flush, let it ride. If you have four cards to an outside straight, and at least one of those cards is a 10 or higher, let it ride. Another clarification for people who aren’t familiar with the concept of an inside straight as compared to an outside straight. Drawing to an outside straight means that you have two possible cards that can complete your straight. For example, if you’re holding 3-4-5-6, two cards could complete your straight–a 2 or a 7. That’s an outside straight draw, and you’re twice as likely to hit your straight with an outside straight draw. On the other hand, if you’re holding 3-4-6-7, only one card could complete your straight–the 5. That’s an inside straight draw, and you’re half as likely to hit your straight with an inside straight draw. Let It Ride poker rules are simple to understand after a few hands. Unlike most table games, the player’s wagers are placed on the table before the hand begins. The overall wager is placed on three different symbols, with one-third of the betting stake placed on each symbol: $, 2, and 1. The dealer deals two community cards. 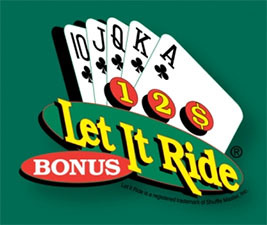 Between each hand, the Let It Ride rules require the player to either take back one-third of their bet or leave it on the table to “let the bet ride”. The ante bet remains no matter what. Rule #1: Three Hole Cards: After the players place their bets, the dealer hands three hole cards to each player. The player must decide whether to retrieve the first bet or not. These are the chips located on the “?” symbol. Rule #2: Community Cards: The dealer deals one more community card to each player. With this extra information, the player decides whether to keep the bet on the “2” symbol. Then the dealer deals on final card, hands are revealed, and bets are paid. Rule #3: Side Bets: Most casinos offer a Let It Ride side bet. These pay out higher amounts on anything between two pairs and a royal flush. The side bet in Let It Ride is a sucker bet, because the house edge is 13.77% or higher. Beating Let It Ride is done through a combination of strategy and good luck. Nothing can help you if the cards don’t go your way, but these following tips for Let It Ride optimal play help increase your odds. Let It Ride has strategy elements, so good player pay attention to Let It Ride tips. Bet 3-to-a-Flush: Bet when you hold three suited cards in a row, except under two circumstances: 2-3-4 suited or A-2-3 suited. Otherwise, pull back your bets. Most flushes with lower cards can build in two directions — 3-4-5 could become A-2-3-4-5, 2-3-4-5-6, or 3-4-5-6-7. The two combinations above cannot build in two directions, so the odds are much lower you’ll hit the flush. Bet 3-to-a-Flush: In all other situations, always let it ride if you are dealt three suited cards. You won’t always get the two more suited cards you need, but the payouts are high enough to make it worth your while, if you do. Bet 4-to-a-Flush: As long as the cards keep coming, keep pushing this bet. Always let it ride if you receive the first community card is similarly suited. Pull back the bet if the fourth card is not suited, though. Let It Ride: Let It Ride anytime you hold four suited cards. Though you’ll fill the flush less than 25% of the time, the payouts are great enough to make this worth your while. Play 4 to an Outside Straight: If you hold four to an outside straight, let the bet ride, even if you have no high cards. If you have at least one high card, this becomes a positive expectation bet. Play 4 to an Inside Straight: Also bet four to an inside straight at times, but only when you have four high cards. If you’re trying to build an inside straight without high cards, the payouts aren’t worth it. Bet on Spread 4: Bet three to a straight flush when the cards are spread 4, if you hold at least one high card. A “high card” means 10 or higher. “Spread four” means the cards are within a spread of four numbers, such as (7,8,10), (8,9,J), (9,10,Q), or (9,J,Q). Bet on Spread 5: Bet three to a straight flush when the cards are spread 5, if you hold at least two high cards. Once again, “spread five” means the numbers you hold are spread between a sequence of five cards. In this case, the lowest spread five would be (7,10,J). Maximum Payout Warning: Many casinos have an aggregate payout maximum. This limits the amount of money that’s paid out on any given hand to the aggregate of all players at the table. When this happens, it increases the house edge, so players should bet accordingly. Lower Bet Amounts: When you see that a brick-and-mortar or online casinos has an aggregate payout limit. For instance, if a casino’s maximum Let It Ride payout is $75,000 per hand, you would divide the jackpot size by 3,000 to determine how much your maximum bet should be. The divider would be different for each maximum payout amount, so study the math further to be precise. Let It Ride poker can be an entertaining way to switch from slot machines to a table game. There’s no competition between the players at the table, and the house edge is better than roulette or Caribbean Stud. On the other hand, if you’re willing to learn basic strategy, you can get a much better house edge playing blackjack. “Let It Ride Poker” is a trademark owned by the ShuffleMaster corporation, so you’ll sometimes see very similar games called “Let ’em Ride Poker” or “Let Them Ride Poker” available at Internet casinos. You’re not allowed to copyright the rules for a game, but you can copyright what the game is called, so Internet casinos get around the trademark issues by using a similar, but different, name for their version of the game.